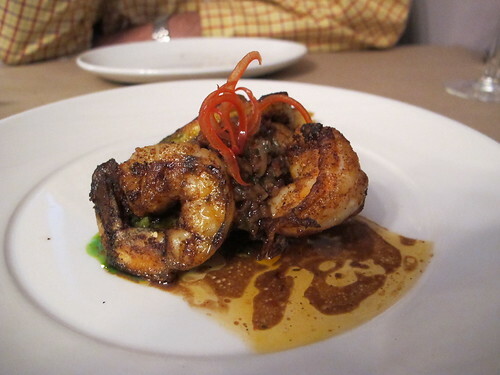 Situated in the Leonidas neighborhood of New Orleans, Boucherie has been on my must try list for months. Originally recommended to me by Nola Maven, Boucherie, meaning butchery in French, is a celebration of all things meat. According to their site, the good people at Boucherie “smoke, age, cure, and prepare” all their meats in house. 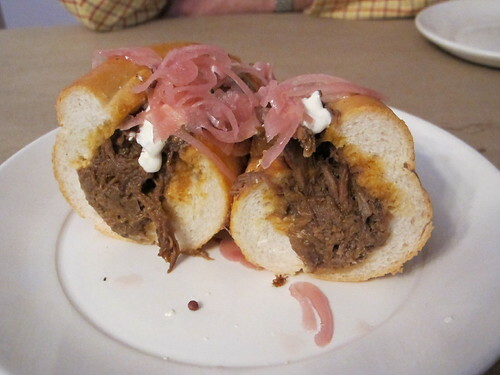 That alone should be reason enough for a visit, but what really sold me on Boucherie was the 2010 Po-Boy Festival. There, amidst the seething masses, I saw a sign for a 12-hour roast beef po-boy. Unfortunately, the line was more than a block long and I had run out of steam. Hoping to make up for that egregious error in judgment, I decided that my next trip to Nola would feature a meal at Boucherie. That was in November, and it’s now February, the prime time for king cakes. Hoping to satiate my need for purple, gold, and green sugar, I hopped in my car and made the drive down to New Orleans. Of course, I should have read the warning signs for that day. To begin, it was snowing when I left the house. I shrugged it off, what’s a little snow? Well, that snow turned to freezing rain and by the time I pulled into Kentwood for gas, I had a thick sheet of ice on my windshield and my wipers had begun to freeze. Undeterred, I hammered the ice off my windshield, freed my wipers, and kept going to New Orleans. 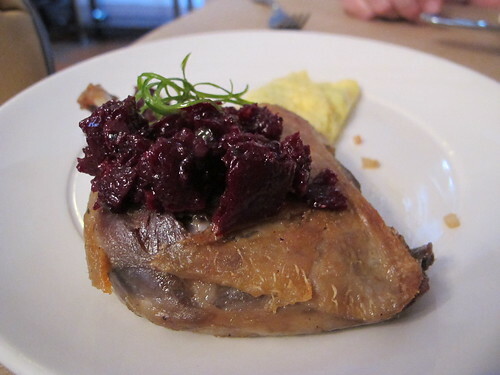 Boucherie is located in a small house on Jeanette Street, an offshoot of Carrolton. With a porch full of tables, it’s a cozy looking restaurant. Inside it was much the same, but with space heaters that weren’t worth a damn. Despite being cold to the core, I was infinitely more concerned with what delights the menu had in store. 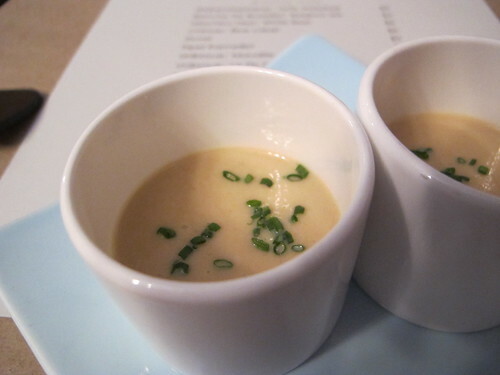 Looking through the February menu, I knew I would have a hard time deciding on just one or two dishes. All four sections of the menu, small plates, large plates, sandwiches, and dessert, were packed to the brim with one enticing dish after another. 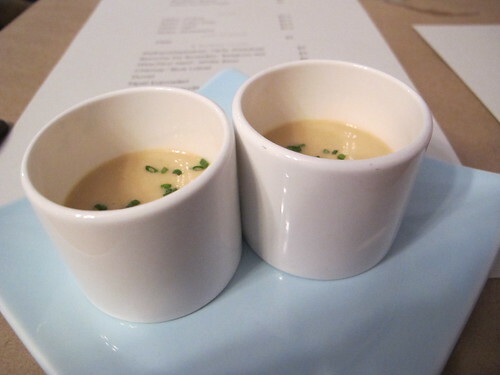 While I was still waffling over where to start, I was brought a complimentary amuse-bouche, a garlic shooter. I like a bold statement to begin a meal. Actually this garlic shooter didn’t have the pungent garlic taste that I was expecting. What it did have was a thick consistency that was full of the rich essence of garlic. Once I had actually figured out what to order, it was a short wait before the dishes began rolling in. 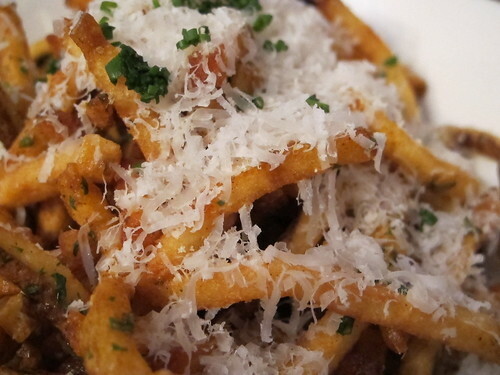 Fresh cut French fries with garlic butter & Parmesan Reggiano, who could resist the allure? 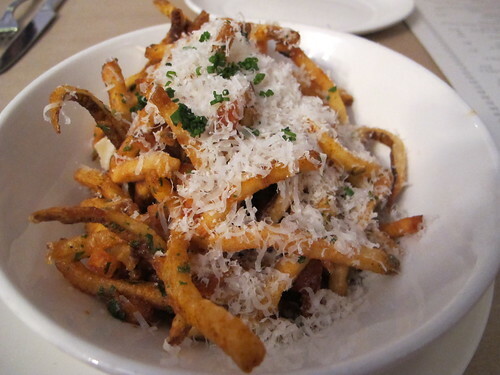 Surprisingly, these are not twice fried, but they are still crispy, well salted and nicely complimented by the Parmesan. It’s not often that I see boudin balls in New Orleans. Those fried balls of rice and meaty goodness are, to me, more associated with Tony’s in Baton Rouge, and places like The Best Stop in Lafayette. 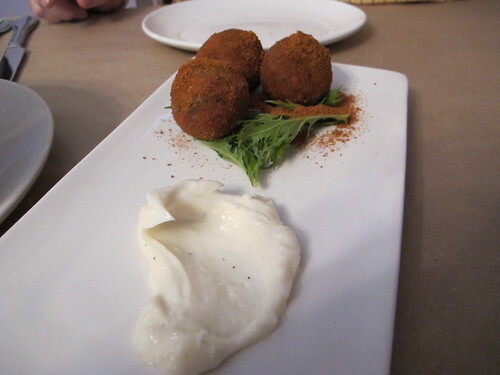 Keeping that in mind, I couldn’t resist the idea of Boucherie’s boudin balls with garlic aioli. Frankly I found aioli a nice addition, but unnecessary. 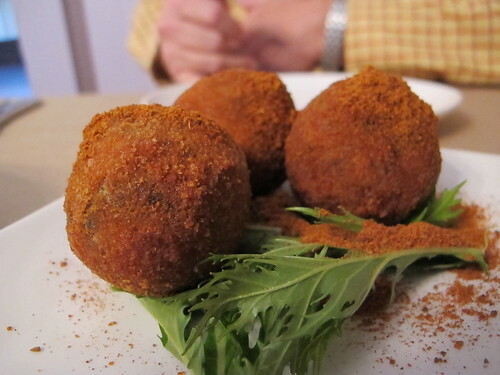 Looking past the aioli, the boudin balls were dusted in a spice mix that was heavy on the cayenne. 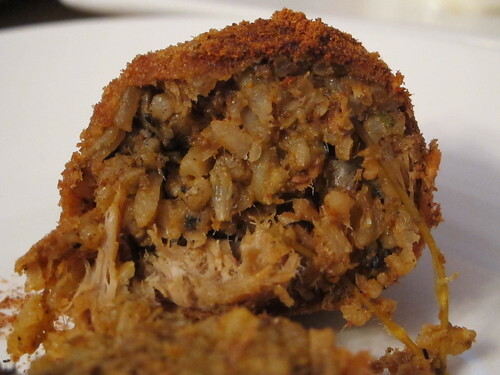 On the outside of each boudin ball was a delightfully crisp, chili laced exterior that concealed a filling of smoky, rich pork with plenty of perfectly cooked rice. Each bite carried a tail of lingering heat and the satisfaction of a well made boudin ball. 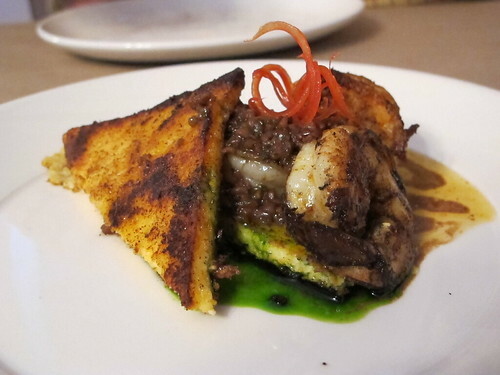 The next small plate was an order of the blackened shrimp and grit cake with warm house made bacon vinaigrette. Surprisingly, this was the only letdown to the entire meal. It wasn’t due to the shrimp. 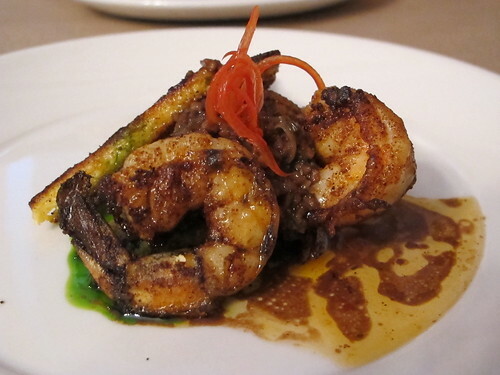 No, these shrimp were beautifully blackened with a peppery crust and juicy, slightly briny meat inside. Of course, there was no issue with the bacon vinaigrette. It was akin to a smoky bbq shrimp sauce based in butter; you know its bad for you, but the taste is worth it. The only real downside to this dish was the relatively bland grit cake and that odd green sauce. It may have taken a few months, but with the next dish I knew that my regrets from the po-boy festival would soon be erased. 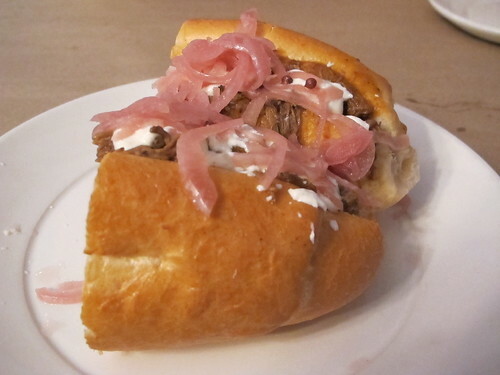 The 12 hour roast beef po-boy, served on bread from Duong Phong and topped with pickled red onions and horseradish cream, it had all the makings of an upscale roast beef po-boy. Actually the bread was the first thing I really noticed. Instead of the slight crunch of a Leidenheimer or Gambino’s po-boy loaf, this bread was more reminiscent of a banh mi loaf or a hoagie roll. 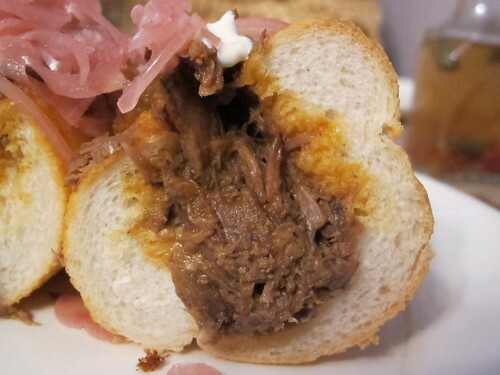 The roast beef in this po-boy is something evil. Even with the lowest heat, the toughest cut of beef, and the most sublime cooking liquid, there is no way that something cooked for 12 hours, outside of bbq, could be this tender, juicy, and rich. Throughout the entire sandwich, there was not a single piece of overcooked, stringy beef. It’s obviously the result of some bargain with the underworld. 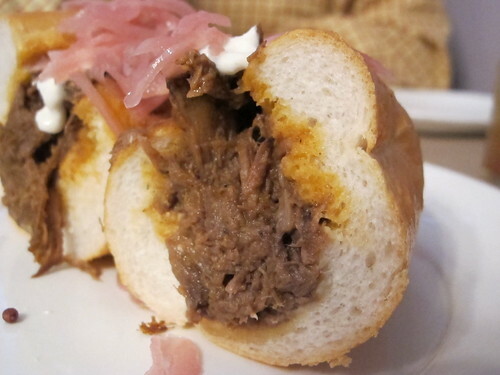 Once you take the beef, courtesy of Old Scratch, and combine it with the snap of a pickled onion and the heady aromas of the horseradish cream, you get a decadent roast beef po-boy that will tickle your taste buds and clean your sinuses. It’s not often that you get a culinary two for one deal like this one. At this point in the meal, I could have happily rolled out the door and continued on my quest for a king cake induced sugar coma, but there was one more small plate on the way. Well, it was a good 10 minutes after the last dish, but that gave me plenty of time to enjoy a sour ale. 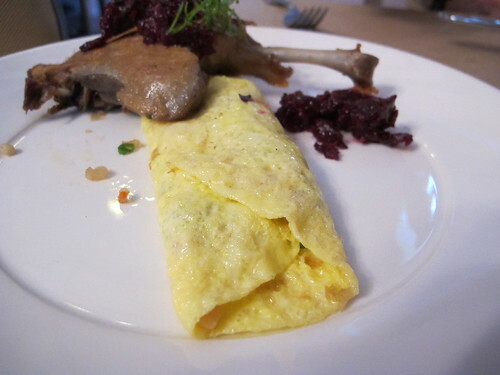 Crispy duck confit with a housemade kimchee omelette & beet & mustard oil vinaigrette truly sounds like an odd combination, but I was genuinely curious at how well duck confit and kimchee would play together. Starting from the bottom, there was an expertly cooked omelette. A barely crisp edge, a tender and juicy body was folded around a rather surprising filling. I was expecting a blood red stuffing of runny, pungent kimchee. What I found was a smattering of green onions and a tiny amount of diced kimchee that provided just enough pungency and spice to keep things interesting but not so much as to overpower the omelette. 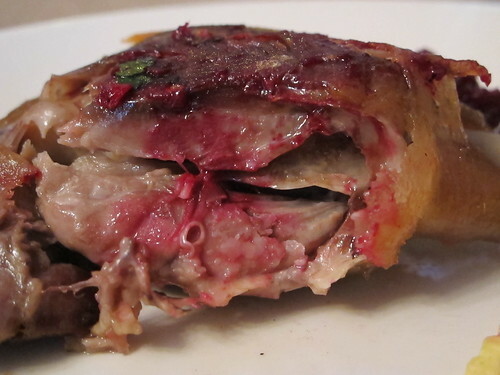 As for the duck, it’s everything I could want from a leg of duck cooked in its own fat. Of course the real surprise came when I mixed the two parts. 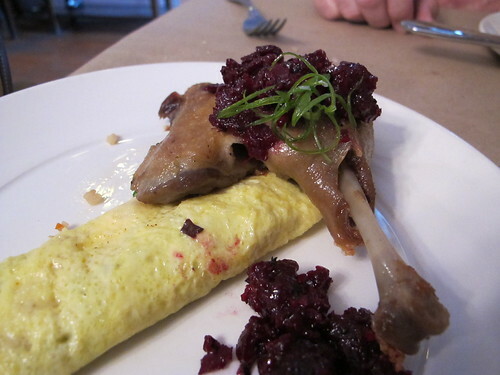 Once the duck and the kimchee stuffed omelette came together, it was a minor revelation. It was salty, rich with the flavor of duck, juicy, and wrapped in a chili powder punch. 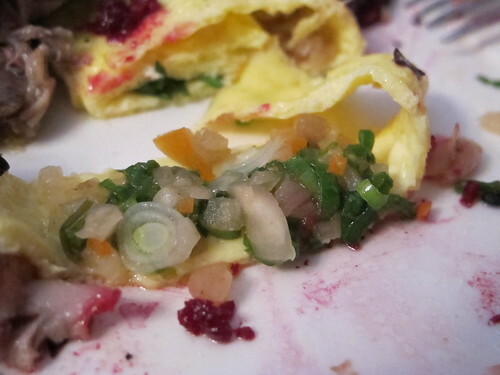 Hyperbole aside, I think I’ve been spoiled when it comes to omelets. Of course the worst part about eating at Boucherie was all the things I had to save for another time. Just looking over the February menu, I find myself salivating at the idea of a smoked Wagyu beef brisket with garlicky Parmesan fries not to mention the intriguing combination of the Thai chili chocolate chess pie. It may have taken me nearly a year to try Boucherie and more than two months to attack their roast beef po-boy, but I can testify it was worth the wait. There’s no doubt in my mind, I’ll be back at Boucherie for another meal. I’ll just have to work on my restraint for next time.